Beneficial Bacteria For Your Water Garden, Is It Worth It? There’s an ongoing debate about the use of beneficial bacteria in a water garden or pond. One side says that this important bacteria needs to be added to the startup of a pond, or even in ponds with heavy fish loads. Others say that it’s not necessary because ponds and water gardens will quickly grow it’s own beneficial bacteria. With the debate raging hot and heavy, let’s jump right into the middle of it. First, let’s take a look at why this type of bacteria is so important to the ecosystem of your pond or watergarden. People normally tend to cringe when a discussion turns to bacteria. Society mostly associates bacteria with nasty, infectious things that cause disease and sickness. What they fail to realize is that there are numerous kinds of beneficial bacteria that exist all around us, and even inside of our bodies. This bacteria actually consumes harmful toxins thereby removing them from the environment. In a pond ecosystem, these harmful toxins can cause cloudy, dirty water and actually kill your fish. The really crazy part is that the fish actually produce these harmful toxins themselves, along with debris such as leaves that decompose in the water. The beneficial bacteria eats the toxins, removing the toxins from the water and keeping the pH in perfect harmony. This is the big question that continues to spark the debate. On one side of the argument, people feel that it’s necessary to add beneficial bacteria to any new pond startups, including coming out of winter hibernation, such as when you complete your watergarden spring startup, and to ponds with a heavy fish load. These proponents argue that although a pond will grow beneficial bacteria naturally, for a startup pond or one that has a heavy fish load, it simply takes too long. In the meantime, you spend time fighting to keep the pH and other important chemical levels in the proper range. It also gives unwanted bacteria and algae time to take root. All of this makes it difficult to provide an ecosystem that is optimum for your fish to thrive in. Now on to the other side of the argument. There are just as many people who contend that adding beneficial bacteria is totally unnecessary and a waste of money. Proponents of this argument make the point that added bacteria don’t actually cause beneficial bacteria to grow. They argue that all the added bacteria does is clean the water out and provide the proper environment for beneficial bacteria to grow on their own. This group also argues that all of the artificial bacteria is grown by basically three national chemical companies. They contend that the bacteria necessary for an optimum pond ecosystem is not stable enough to be shipped in a bottle, and therefore is unable to be sold in a bottle. It simply won’t survive that long. They further this argument by saying that every area and environment is different, so what works in one part of the country would not work in another. By their line of thinking, pond owners should look to inhabit their ponds or watergardens with bacteria from their immediate environment as that is the bacteria necessary for the local ecosystem. Here’s the deal, though. Just like with many arguments that take place, there’s no real right or wrong answer. If you don’t feel it’s worth the investment to add beneficial bacteria to your pond, then don’t. The proper bacteria will grow quickly enough and you’ll just have to work to make sure your water stays within proper parameters in the interim. If you want to start your pond out right from the very beginning, then make the investment in beneficial bacteria. It will infuse your water ecosystem with the bacteria necessary to control important chemical levels, allowing your fish to grow and thrive quickly. Both sides agree on one thing, though. If you don’t have fish or plan to have fish in your pond, adding beneficial bacteria is unnecessary as it will grow quickly enough on it’s own without the fish byproducts altering the chemical balance. In order to get your pond set up to have an enjoyable season, there are a few things that need to be done. It’s important to pay attention to them, and do them properly, so as not to harm your fish and plants. If you don’t have fish, not all of the steps will apply, but the ones that apply to fish are quite obvious. Clean up the area around your watergarden. Rake around the area to clear it of sticks and other debris that can get into your pond and cause problems. It’s also time to remove any netting that you used to cover the pond for the winter. Remove any debris from the pond. Any floating leaves or other debris needs to be removed so that they don’t start to affect the chemical balance of your watergarden. You can use a skimmer net to remove anything floating on the surface that doesn’t belong. Clean and replace water plants. Take a look at the plants you have as a part of your pond ecosystem. Any plants that were moved and winterized over need to be placed back in their proper spot. Remove any dead branches, leaves, or flowers. If you had any plants die over the winter, it’s time to get them replaced with new ones. It won’t be long before it will be time to start fertilizing them, but that won’t be for another couple of weeks. Change the water in your pond. There’s some debate about this, but the best information I can find is that this is a good time to check your water. If you notice just a small amount of sludge or other water issues, changing between 1/4 and 1/3 of the water should take care of that and get your water back in line. If you notice extreme sludge (over 1? ), there’s something else going on with the ecosystem, so a 100% water change is a good idea. It’s better to resolve these issues now than to spend a significant amount of time and money trying to locate a larger problem later in the season. Check filters and reconnect pumps. It’s time to take a look at your filters. If you didn’t clean or replace the filter pads in the fall when winterizing your water garden, that should be done now. Replace old and worn filter pads, and clean those that still look to be in good shape. It’s not recommended to start your pump up until the water temperature gets over 50 degrees as your fish will remain mostly dormant until that point. You also don’t want your pump running full blast while your fish are just coming out of winter hibernation as they’ll still be weak. Test the water quality. After changing out the water, you should check the chemical balance of your water to get it back into and keep it in the optimum chemical range. Doing this will ensure a strong and healthy ecosystem for your pond. Add water treatment products. Now is a good time to add some barley straw extract to keep your water clean and clear. A water clarifier will help if you have cloudy water by causing the suspended particles to clump together so they can be skimmed off of the surface with a net. Getting your water clean and clear now will make it easier to keep it that way as the season progresses. Perform ultraviolet (UV) light maintenance. If you have a UV light in your filtration system, the bulb should be replaced once a year. If it hasn’t been done, it’s time. You should also clean the sleeve that houses the bulb. Once this is done, you should leave the light off for 48 hours to allow the beneficial bacteria to colonize in your pond. Prepare for the return of predators. As your fish become more active, so do their natural predators. Stringing line across your pond can help keep the birds away. A fake standing heron or alligator is a great deterrent as well. A straight drop-off at the edge works for raccoons, as they love shallow shelves to walk around on. Another great idea is to have a motion-activated sprinkler head that will spray when it senses motion. Taking a few simple steps will prevent your pond from becoming an open buffet for the natural predators of your fish. Begin feeding your fish. Wait until the water temperature is over 50 degrees, and then start feeding lightly until the water temperature gets up to about 65 degrees. This is a great time to take a look at your fish for things such as red fins, fins full of veins, excessive mucus production, lethargy (not to be confused with slow movement as they come out of dormancy), wounds or scratches, gasping at the surface, or congregating at the waterfall. Be careful how your treat your fish as they’ve been dormant and their immune system is weak. Following those steps will get your water garden ready for the coming season. Doing a little bit of work on the front end will save you time, money, and frustration throughout the rest of the season. Water garden fountains are a real alternative to a garden pond if you want water in your garden. Compared to a pond water garden fountains are easier and cheaper to install. Whilst some can contain fish this is not the main reason to select water garden fountains. Water garden fountains should be lightweight and easy to work with. Natural lightweight rock type features blend into a garden magnificently. Another name for water garden fountains is self contained water features, or a self contained water garden. Water garden fountains need not just go up. There are features these days that flow into underground ponds or reservoirs and take on the appearance of a stream or individual rock feature. When all is said and done not all water gardens are suited to Venus De Milo type water garden fountains. In fact few are. Just a few words about a pond fountain arrangement. I suspect when many people talk about a pond fountain they are really meaning pump fountain heads or pond waterfalls. The handling of a true pond fountain project (full blown pond with waterfall) especially if fish or koi are to be kept in the pond must be treated with a lot more care and thought than if you are looking for a water feature or pond fountain which is a essentially a self contained cascade falling into a small pond or reservoir there just to hold the re-circulating water. 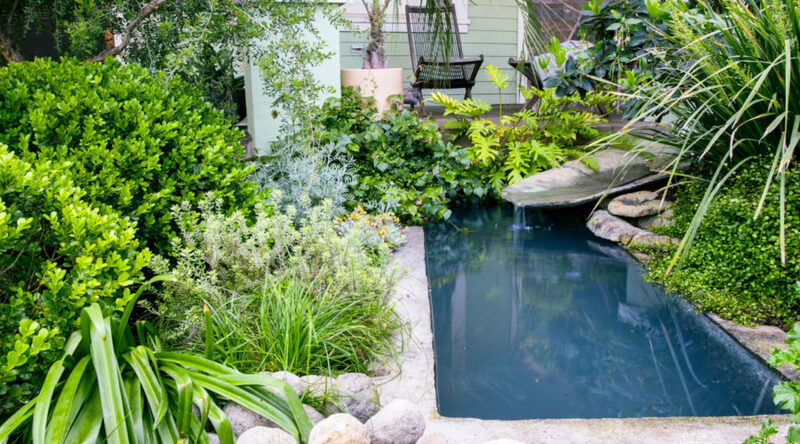 A pond is a wonderful addition to a garden or yard. It is more difficult to get right than a simple fountain arrangement. A word of warning in choosing resin or fibreglass water garden fountains make sure that the surface appearance is not a low cost painted surface that might be eroded over time. Look for realistic appearance resulting from the use of natural aggregates or stone built into the product and not just applied to the surface. All the pictures of water garden fountains you see in this web site have been chosen with this in mind. Take a look at these water garden fountains and let your mind wander a bit. What do you think? It is certainly hard to believe these are not the real thing. 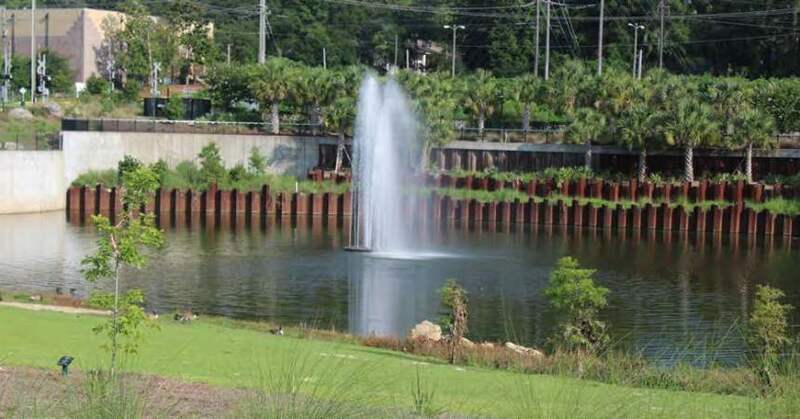 Pond owners in hurricane prone areas need to be prepared for a natural disaster. Its always best to plan for a near worst-case scenario. Sometimes there is a mandatory evacuation and then you can only hope for the best. Other times, a storm comes through and causes a loss of power for a few days. In this guide, we will look at the second scenario. First you will want to get as much information as possible regarding the storm from your local weather station. Next go out and survey the pond. Locate all objects that could potentially go airborne and store them indoors; examples of this would include garden decorations, a chair, etc. Its likely that debris will enter your pond so perform maintenance on your filters. Next drain your pond significantly–you’ll have to use your best judgement based on the weather forecast as when the storm comes through so will a large amount of rain. Then lower your marginal/bog plants into a deeper section of the pond. There isn’t anything that you can do for your pond or its inhabitants during this time. Do not endanger your life! The rain will refill the pond–this was the reason for you draining it prior. Upon the storm passing, do another survey of the pond to ensure its safe to approach or accessible. If you have power, temporarily power down all filters and remove the debris with a net. This means limbs, leaves, anything foreign, etc. If there is a mechanical filter, go ahead and rinse it clean and replace. Then power back up all filters. Also perform a small water change. Consider waiting a day or so to feed your fish as your filters will have enough waste to filter through. If you do not have power, you will want to first remove as much debris from the pond as possible. Then get those battery powering air pumps operating immediately. We recommend placing the output of the airline tubing that runs from the air pump so that the bubbles make contact with the activated carbon. The debris may have cause toxins to enter the pond and the carbon will start to absorb impurities–however, it needs water movement to be effective. Resist the urge to feed your fish! Their waste won’t be able to be filtered–they will certainly survive a few days without food! When your power returns, perform a large water change and get your filters running again. Its likely that they will go through a small cycle as the bacteria levels in your biological filter would have been reduced drastically. You can now remove the battery powered air pumps. Relocate the activated carbon to an air with strong water flower such as a waterfall or the exit point of a biofilter. Feed your fish minimal amounts of food until your filter catches back up. You must remove all casualties immediately. Your plants will be tattered but they are resilient. After a couple days, you may notice foliage beginning to yellow–go ahead and remove it so as to stimulate new growth. Today we will have a look at one method for getting tropical water lilies to produce tubers. Remember that tubers help a great deal when overwintering tropical water lily plants. This method works by you guessed it stressing the plant. In native waters there are periods of drought and tropical water lilies respond by creating tubers. When the rain returns and water levels rise back to normal, the tubers sprout and grow new plants. Its a rather neat cycle! You can trigger this response in your own pond or water garden. First we’ll need to know several things. This is a process that takes some time and doing this will cause you to lose a good portion of your growing season (no blooms). You’ll need on average about two months of time and its recommended that you do this towards the end of your season as it just makes more sense. So to restate that–acquire a tropical water lily, enjoy its majestic blooms for the first half of your season or so but leave around two months for stressing via drought. It should begin to get cold by the time the stressing period is complete–this further stresses the plant. Weeks 1-2: Unpot tropical water lily from large pot and move to a small pot–do not fertilize. We highly recommend a pot with holes at the bottom but more important choose a pot that is smaller than a gallon. We have had amazing results with quart pots. Week 3: Move the tropical water lily which should be in a small pot closer to the surface of the water. If you had it at say 18 inches of depth, move to 9 inches. Note that that we measure depth from the water surface to the crown of the plant. Week 4: Move the tropical water lily even closer to the surface of the water. If before it was at 9 inches, now move it to 5 inches. You are about half way, you’ll notice several things occurring. First you’ll see a decline in plant size which means smaller and less number of blooms. This is normal. This is great as these are signs of stress. Next you’ll see the foliage do something remarkable. They will begin to curl upwards and as you progress with this stressing period, the plant will hold the foliage out of the water similar to what lotus plants do. Week 5: Once again move the tropical water lily towards the surface of the water. It was 5 inches, now move it to 1 inch. Weeks 6-7: Keep the plant at this level. The plant should have stopped blooming and cold weather should be approaching. Week 8 or more: You will want to leave your tropical water lily plant until just before the first frost will occur. Send it to a warmer climate. There are some places that tropical water lilies grow and bloom year round (that sounds like our location in Florida). Toss the plant–although not recommended. Grow the plant inside during the winter. Your tropical water lily is stressed through a small pot, lack of nutrients, simulated drought, and finally cooler water temperatures. It must occur over a period of time as tubers do not form overnight. Good luck!